Latin for 'raceme', referring to the inflorescence. Fagraea maingayi Clarke in Hook.f. Fagraea pauciflora (King & Gamble) Ridl. Fagraea rodatzii K.Sch. & Laut. Fagraea volubilis Wall. in Roxb. Willughbeia racemosa (Jack ex Wall.) Spreng. Willughbeia volubilis (Wall. in Roxb.) Spreng. Understorey tree up to 17 m tall and 30 cm dbh. Stipules ca. 7 mm long, fused into an annular ring around the twig. Leaves opposite, simple, penni-veined, leathery, glabrous. Flowers ca. 16 mm diameter, white-yellow, long corolla tube, placed in racemes. Fruits ca. 15 mm long, yellow-pinkish-blue, berries with many small seeds. Light to rather dense, often secondary forests on swampy to dry soil, on muddy riverbanks, podsolized sand, sometimes in savannahs and lalang fields, 0-2000 m. The flowers have a smell of butter or buttermilk, as they produce diacetyl, a substance which is characteristic of bat-visited flowers; there are, however, no observations that Fagraea flowers are visited by bats. Fruits are bat dispersed. The soft to moderately hard timber is used for construction and as firewood. 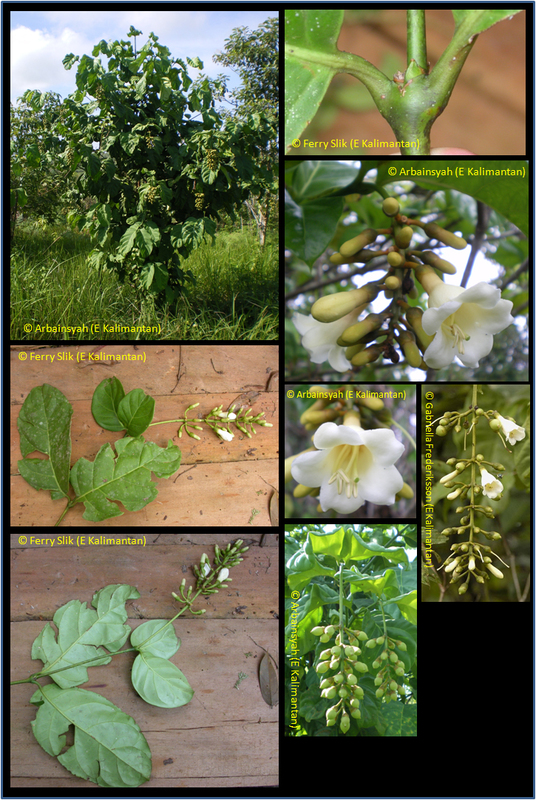 Decoctions of the leaves, bark, and roots play a role in Malayan medicine, mainly as tonics; in the Philippines the bark and the flowers are used as an antidote for snake bites. From Burma and Indo-China to New Guinea, Australia and Solomon Islands. Borneo: Engkudug biang, Girang, Sukong ranyai, Tembusu gaja, Tigaan, Todopon puvok, Ukudu ayer.